Dr. Bob Brier has worked in Egypt for more than 30 years and is one of the world's foremost authorities on mummies. He is Senior Research Fellow at the C.W. Post Campus of Long Island University in Brookville, New York where he teaches Egyptology courses such as "Middle Egyptian" (Hieroglyphs) and a seminar called "The Mummy." 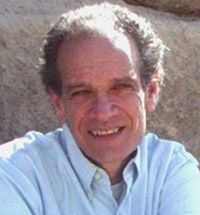 His most recent work has been on the Great Pyramid of Giza, which was featured on a National Geographic television special and is the subject of his most recent book, Secret of the Great Pyramid (Smithsonian). In 1994 Brier made international headlines when he and his colleague, Ronald Wade, became the first people in 2000 years to mummify a human cadaver in the ancient Egyptian manner. Using ancient tools and materials, Brier replicated the mummification of an ancient Egyptian pharaoh. The story of the project has reached more than 25 million readers, TV viewers, and radio-listeners world-wide and was the subject of a National Geographic TV documentary, Mr. Mummy. Brier's projects include reconstructing the tomb of an Egyptian nobleman, complete with accurate hieroglyphs, for the Hillwood Art Museum at C.W. Post. He is the author of numerous books, including, Secret of the Great Pyramid (Smithsonian), Daily Life of the Ancient Egyptians, The Murder of Tutankhamen, Encyclopedia of Mummies, Egyptian Mummies, and Ancient Egyptian Magic (William Morrow). He has collaborated on numerous television specials and was the host of the Discovery Channel's six-part series The Great Egyptians, the three-part series Unwrapped, the Mysterious World of Mummies and a series about his research called Mummy Detective. His latest documentary was Unlocking the Great Pyramid for National Geographic. He hopes to gain permission soon from Egypt's Supreme Council of Antiquities to determine if there is a hidden mile-long ramp inside the Great Pyramid. Brier is also currently studying mummies to determine whether Alzheimer's disease existed among ancient Egyptians. "The authors' prose is lucid, aided by drawings and photos, and the theories are intriguing." 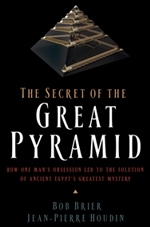 "It's a plausible theory, well-illustrated, and makes a useful addition to the always seductive study of pyramids... An intriguing new twist to an old enigma." "A serious attempt at a new explanation for one of the oldest Egyptological mysteries."